From August 24 through August 28, 2009, Fox News aired 22 clips that were critical of, or opposed to health care reform efforts supported by Democrats. 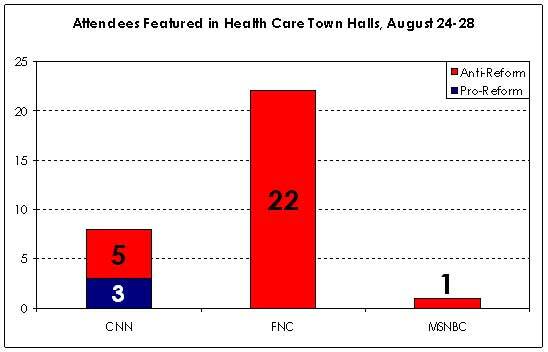 During that same period of time, Fox News showed ZERO, ZIP, ZILCH clips that were positive, or showing people supporting health care reform. So, Fox News supporters, where’s the “fair and balanced” reporting you’re so brainwashed into repeating, ad nauseum? Don’t bother bringing any other media outlet into the discussion… This is about Fox News’ obvious disregard for reporting both sides of the story. I have to admit to having something of a jaundiced view of Fox following one presenter’s on-air tirade against the BBC. The presenter accused the BBC of lying following the outcome of the highly controversial British government enquiry. This all occurred at the same time as the BBC was taking audience share from Fox in the north eastern United States. Quite a coincidence. So, unbiased reporting by Fox or indeed any broadcast or media operation is, frankly, unlikely. Not just because of in-house politics, but also for the need to get an audience rather than inform one. This accounts for sensationalist reporting on many (all?) sides and, it may be argued, Fox is no innocent in this scenario for its reporting of Healthcare as much as any other topic.